Asus has confirmed that the new Nexus 7 will hit the UK on August 28. The new Android 4.3-running tablet was unveiled by Google on July 24, and the tablet went on sale in the US just six days later. At a London event today, Asus confirmed that August 28 was the date for UK diaries. The new Nexus 7 will come in two versions - the £199 16GB Wi-Fi model and the £239 32GB Wi-Fi edition. 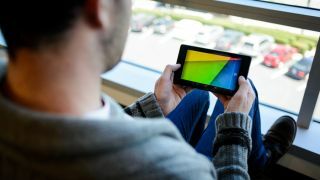 Google's Nexus 7 follow-up flaunts a full HD (1920 x 1200) display, making it - as Google claims - the highest definition 7-inch tablet around. Meanwhile, there's a 1.5GHz quad-core Snapdragon S4 Pro processor doing the work, with 2GB of RAM doubling the original. That nice display is also protected by Corning Gorilla Glass, so no worrying about pesky scratches scuffing up your slab. It's expected that the tablet will be available on the Google Play store from August 28, as well as from high street retailers. What did we think of the Nexus 7 in our first hands on? Why, you can find out right here.